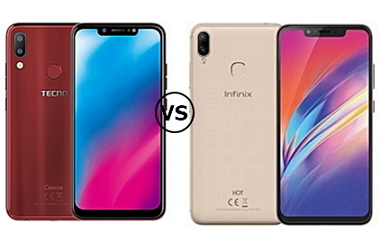 Sometimes last year, Tecno launched the awesome Tecno Camon 11 device and Infinix on the other launched Infinix Hot 6X, and both devices have been enjoying massive patronage since their launch, meaning that both Tecno and Infinix did a nice job on the devices. While some have contemplated between the two devices on which of them to buy, others have wanted to get a clear comparison first before making a choice between them. The first thing to note between these two devices is that while the Tecno Camon 11 is an MTK device, the Infinix Hot 6X is a Qualcomm Snapdragon device. And secondly, the Tecno Camon 11 came with Power VGR GPU whereas the Infinix Hot 6X spots Adreno 308 GPU. Aside these two major notable differences both devices worth for good comparison and that is exactly what we want to do for you by carrying out specs comparisons so you can clearly spot their differences. 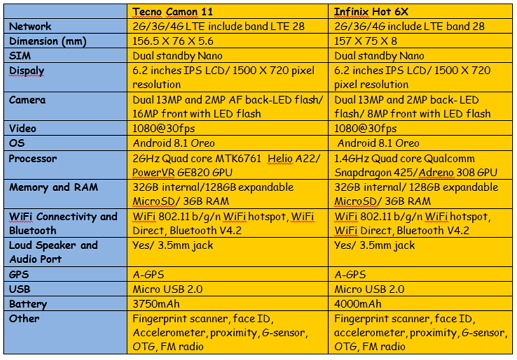 Without further ado, we will present Tecno Camon 11 and Infinix Hot 6X spec comparison in the table image below.